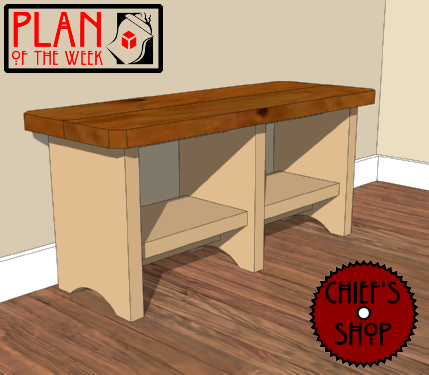 The Chief’s Shop Ready For School Bench can be used in a foyer, mudroom, or garage as a staging area for preparing to leave for school, or heading off to the bus stop. This project has two options for the lumber needed. One lumber list and cutting diagram are for those who have a table saw and are comfortable ripping 2x lumber. The other is for those who may not have a table saw or are not comfortable ripping 2x lumber. Other than the optional table saw, this plan requires a miter saw, jig saw, drill driver, and Kreg Jig.